buddies at Glyde – an online marketplace where people can easily and safely sell or buy used phones, tablets, or video games at bargain prices. Right now on Glyde you can make up to $482 for your old iPad 2 64GB AT&T or $284 for an iPhone 4 8GB AT&T. 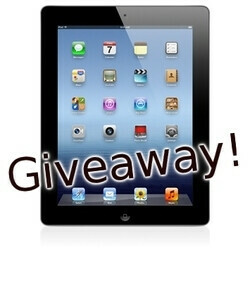 And don't wait until the very last moment to enter - our iPad giveaway will be over on Monday, April 2nd, 2012. Well, that is it! Participating in our iPad giveaway could not have been any easier. Now go mash those Like and Follow buttons, drop us a comment, and keep your fingers crossed. The winner will be notified by email, he or she has provided upon registration. Phone Arena reserves the right to re-draw the prize if the prize-winner does not reply within three days after being contacted. Do all three need to be done? Or just one? For example ... adding a comment here ... is that sufficient? I want it so badly :( I never had an iPad. Greetings from Bosnia. don't waste the time. Just get a non-Apple tablet. Bosnia? Shouldn't REAL apples an food be a priority over novelty electronics? Mandroid instead of buying tablet I suggest you to invest money in your education, it's obvious you are in lack of it. Do us a favour and next time educate yourself before posting. btw give me your address so I could send you apples and food :) PS. typing from iPhone 4S. What a heartless and ignorant statement. No wonder the world hates us. Mandroid is just lost person. Liked ya on FB, following on twitter (denidtigner), Thank you!!! I'm in the US, over 18, and in need of a free iPad. I want it like crazy!!!!! android user here, but wanna try out the iPad. I would love an iPad. I've never had one but they look awesome! I need this new iPad in my life right now!! !